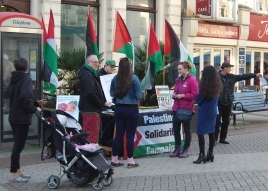 This Saturday, we'll have a stall at the Kings Road market (TN37 6DY), 10.00 until 16.00. If the August market was anything to go by, there should be a good selection of food, drink and craft products. Please come along to say hello and support. 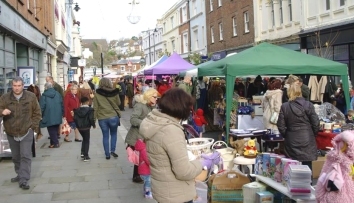 (We won't have our usual stall in Hastings town centre. Note: our 17 Sept stall will be 11.00 until 13.00.). 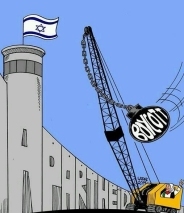 Israel: 21st Century Apartheid with journalist and author Ben White. Saturday 17 Sept 14.00 - 16.00 / 2 - 4pm. 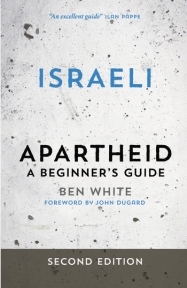 "I gladly wrote a foreword for Ben White's Israeli Apartheid: A Beginners Guide. He is a writer who is determined to present a fair picture of the troubling situation in Palestine." John Dugard, former UN Special Rapporteur for Human Rights in the Occupied Palestinian Territories. We hope that as many people as possible can come to the meeting to ask lots of challenging questions of Ben - especially as he will be travelling all the way from Cambridge to be with us! 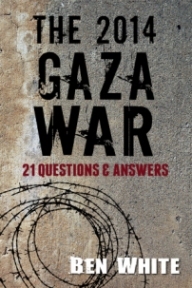 Ben's new Ebook "The 2014 Gaza War: 21 Questions & Answers" has just been published. Information here. Our July meeting marked 2 years since Israeli's 51 days of killing in Gaza and 10 years of crippling siege, We were pleased to have as our speaker Ahmed Masoud who grew up in the Gaza Strip. He spoke of the vibrant life in Gaza. In fact Ahmed was really very positive - showing how power structures can be dismantled, and demonstrated how the only answer to the conflict is the 'One State Solution.' Thanks to everyone who came to our meeting and especially to Ahmed. Ahmed's website. Demonstration at Israeli drone manufacturer. Instro is owned by Israeli arms company Elbit, Israel's biggest drone manufacturer. It's 2 years since the Israeli massacres of the people of Gaza where 2200 Palestinians (including 551 children) were killed - many by drones supplied by Elbit. The picket at the Broadstairs factory closed the operation down for the day. Well done to the contingent from Hastings. Article in local paper. Celtic fans defied UEFA rules and threats by police during the Champions League qualifier against Israeli Hapoel Beer Sheva. 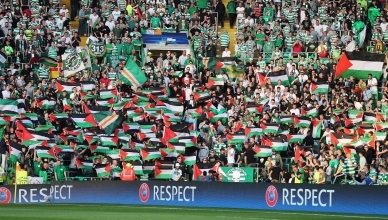 Celtic football fans fly flag of Palestine. Tell FIFA: Israel must ban settlement-based football clubs from FIFA competitions. Info and petition. Palestinian footballers shot by Israeli forces never to play again. No let up in demolitions. Estimates show that some 48,038 Palestinian structures have been demolished in occupied Palestine since 1967. Source. In fact there has recently been a surge in the number of demolitions. Some news items from just the last 3 weeks: 50 family members homeless after Israeli demolitions. Israel to demolish Bedouin school near Jerusalem. 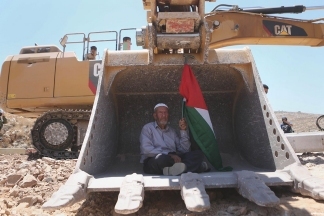 Israeli demolitions in Bethlehem leave 20 homeless. Israel has demolished more Palestinian homes in first half of 2016 than all of 2015. Jailed for refusing to join the Israeli army. Tair Kaminer Released From Prison After 159 Days. 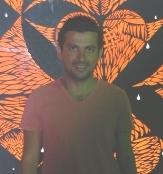 Omri Baranes sat in military prison for 67 days for refusing to join the Israeli army. End the 10 Year Siege of Gaza. 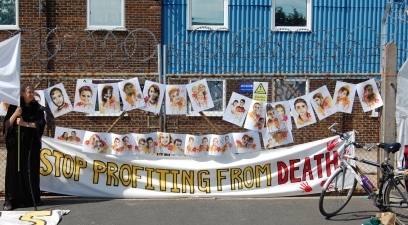 Great creative action in Brighton to mark 10 years of siege. Respect to Brighton and Hove PSC. Video here (quick version). Meet the Israeli army's misogynist chief rabbi. Israeli army commander: I will make all the youth of Al-Duheisha camp disabled. Killing them slowly: Diabetes in Palestine. Support Shadi Farah, the youngest Palestinian Political Prisoner. Israeli think tank: Don't destroy ISIS. How Israel is trying to enforce gag orders beyond its borders. Threats against Palestinian group's lawyer at The Hague. Ex-UN official: Israel's Crimes are "Infinitely Worse" than in Apartheid South Africa (May 2015). Palestinian music band protests Israeli Security Forces with an impromptu concert. Israel's desalination miracle, Santa Claus and other fairy tales. IOF arrests Hamas members in WB prior to elections. Far from the public eye, Palestinian villages are being dried out. Israeli soldiers kill Palestinian with special needs in Silwad. Mass knee-capping of Palestinian youth. How Israel is drying out Palestinians in the Jordan Valley. The secret report that helps Israel hide facts (July 2014). Portuguese government withdraws from controversial project with Israeli police following BDS pressure. Canada's Green Party backs Israel boycott. Leading Lutheran branch calls on US to cut off aid to Israel. Belgian airliner stops serving dessert made in Israeli settlements. BDS movement: what to boycott "targeted consumer boycotts."